Oh Adrian Tomine. How do I love thee? Let me count the ways! There are various ways that one can come to Tomine's work. From the New Yorker, from various album covers, or from his comics. I found Tomine through Optic Nerve which remains one of my favourite comics of all time. Scrapbook is a wonderful collection of early work, later work, rework, and illustration. Eventhough I am familiar with lots of his stuff, this collection was still fresh to me. One of the things that I love, is that his stuff isn't always autobiographical. Don't get me wrong, I love the whole comic scene like that (Joe Matt etc), but as a reader, I really love the characters that Tomine develops. From the hipster to the sociopath (that creeeeeeepy laundromat guy *shiver*), Tomine gets the voice down in such a way that the reader feels for each and every character. You may not necessarily like the character, but doubtless you will feel something. A wonderful way to spend the afternoon. I will revisit this often! Another book that I wanted to read after my high school librarian booktalked it. Set in South Africa during Apartheid, Emily's family is falling apart. Mother and Father rarely speak, and when they do it is just to argue. Mother is upset that Father isn't keeping her in the lifestyle that she imagined for herself, and Father is tired of Mother's browbeating. The only time that her parents seem to stop arguing is when other people stay at their compound. This time it's the gyspies. Not gypsies like one would imagine, her Father assures Emily. This is a wandering family from Australia. Jock, the nature photographer, wife Peg (with her omnipresent snake Opalina around her neck), and sons Otis and Streak. It's plain to see that Otis is simply not right in the head, and Streak is a bit of a wild one himself. Emily immediately takes to Streak, and sister Sarah is so kind and gentle that Otis' ways do not seem to bother her. The family's night watchman, Buza, has a bad feeling about these visitors. Emily spends her evenings with Buza, listening to his Zulu stories. He is the only person who can make Emily feel whole as her family splinters apart. This is a beautifully written tragedy. Emily is young enough that her emotions are raw and on the surface and Linzi Glass writes her voice perfectly. In fact there are no weak characters in this story. Each is integral, and everyone grows in some way. I have a bit of an interest in South Africa as a friend of mine lived there for several years, and I have recently aquired a South African penpal. However, I think that this is a book that will appeal to most fans of the written word. It is not for younger YAs as themes of infidelity, sexual abuse, and death are present. It is, however, wonderfully written and a pleasure (despite the pain) to read. Our high school librarian booktalked this for a parent night we had at school and I knew I had to read it. Then, I was fortunate enough to hear Patricia McCormick read at Donnell for the YA National Book Award press conference. After that, I couldn't wait to read Sold. Lakshmi is 13 and living with her mother, baby brother and stepfather in Nepal. They get by, mostly because of Lakshmi and Ama. Stepfather gambles away his nights in the teahouse and does not work during the day. But as Ama keeps reminding her, any man is better than no man. After a long draught, the monsoon wipes out the meager crops that the family has. Stepfather announces that Lakshmi must go to the city to work. Lakshmi is nervous, but she is looking forward to helping her family. After all, since Gita went to the city to work for a rich family, her own family has a sun in the living room, a new set of pots, spectacles for father, a wedding dress for her sister, and school for her little brother. Lakshmi just wants to earn enough to get a tin roof for her mother. Four days of travel leave Lakshmi not in a wealthy house in the city, rather in Calcutta's red light district. She has to work until the sum Mumtaz paid for her is gone. But Lakshmi doesn't understand the city math until one of the other girls explains it to her. 13, in a strange city, locked in a brothel, speaking little Hindi what chance does Lakshmi have? This is an amazingly powerful story. Especially since it's based on fact. Sparsely and beautifully written, Sold can open eyes to a world that Western youth generally never thinks about. The Author's Note alone brought tears to my eyes. You must have noticed that this is the time of year that folks break out the "Best of" lists. I don't feel like I have read widely enough this year to really comment, so I decided to take a little walk down memory lane. Before Blogspot, I used to keep track of my books in this cute little "Books I've Read: A Reader's Journal". So I pulled out my volumes, blew off the dust, and took to reading about what I have read in the past. There is some great stuff in there, and maybe I will backtrack and blog them sometime, but for now, here are my "Top 25 Books Before the Blog"! So there you are. No particular order, but I enjoyed each one. Some got panned in the reviews, but...I like what I like and I rarely apologize for it! So the prom to the teen is somewhat like New Year's Eve to us old folks. Big anticipation, and a bit of let down. I would know. I went to 3 "formals" as they were called in my hometown, and each was depressing in its own little way. Laura has decided that it is her duty to get her old friends together to have the night of their lives. She has her date, Jace thinks she can get one with the new tennis boy in town, and they will simply have to help Chloe out. Can these three overcome their differences in time for Prom? Is there really such a thing as a perfect night? What happens when you figure out that your boyfriend is a jerk? All important questions to be answered. Blake Nelson's Prom Anonymous will most likely appeal to a younger teen girl. You know how I feel about the super different friends coming together...(see Queen of Cool )But Chloe is so helpless and Jace is so nice and Laura is a mess, so as a reader, I found myself rooting for the night to go well. Not my fav, but an entertaining read, nonetheless! ...so you knew what was coming, right? My tendancy to binge on a series continues. We follow Cyd to her post highschool year in NYC. Cyd is living in the Village with her half brother Danny, and she is valiantly trying to avoid higher education. Fortunately, she has loads to keep her busy. Friend Autumn is ditching classes at Columbia, there is the search for the ultimate caffeine (not easy, I live in NYC and I know!) , Luis may be back in the picture, and there is the neighbourhood curmudgion to win over. There is nothing really surprising about the latest in the series. Cyd is trying to find herself and her place in her family. She is trying to put Shrimp behind her, but the fates seem to be working against that little situation. This is a very NYC-centric story and a very Village-centric story at that. I think, however, the juxtopposition of Cali and NYC is just what Cohn was working on. A big, in-your-face showing of the "then" and the "now"....growing pains included. This will serve well to the readers who love the Pants and have outgrown the Princess Diaries. The hot pink covers do little to belie the 18-year-old stuff going on inside. My niece will love them! Ok. So I wasn't a huge fan of Gingerbread. The whole "Sid" and "Nancy" parents offended my somewhat punk sensibilities. I left Shrimp unread on the shelves for a year or so. Then the Cupcake arc showed up at work and I wanted to read it. Jen let me know it wasn't too good of an idea to read one without the other, so Shrimp got read. Cyd and Shrimp keep finding each other, but Cyd soon finds that she is no longer the hellion she once was. And maybe Shrimp and his wandering ways are no longer for her. This is a great read for older teens who may find themselves in relationships that they no longer understand. The dialogue, though wonky, rings true and I found my 36 year old self yelling at the book "Break up with him dammit!" I really did enjoy this book much more than Gingerbread. Did I just get over the Lia Block comparisons and unfortunate character names? I don't know. Maybe I dated one too many "artists" in my youth? Now here is a book that many told me my music lovin' self needed to read. And yet, I kept putting it off. Why? I was scared of being disappointed or underwhelmed. Sometimes YA books that discuss music, seem to do it in a grown-up "I still know all the hip music" inauthentic way. Boy, was I ever pleasantly surprised. Nick is trying to get over Tris. Tris who he confessed his love to only to get dumped. He wrote songs for her. He loved her. And now, here he is in this crappy NYC bar, playing with his band, and who is out in the crowd? Tris. Nick tries not to notice her, but it is impossible. Norah is trying to keep an eye on Caroline. It's not so easy to keep being the straight-edge friend to the drunk hook up girl. But Norah and Caroline go way back. Caroline is currently trying to get with one of the band boys when Norah notices the bass player from the previous band standing next to her. And that b*tch from her school Tris is coming her way. Bass boy asks Norah "I know this is going to sound strange, but would you mind being my girlfriend for the next five minutes?" Who knew that one question could change everything? Who knew that 12 hours could shape your future? This is one of those take the plunge and fall into it books. As a reader, you've got to buy it, or you won't like it. Well...I bought the farm. I LOVE Nick. I don't know why, but I do. He's smart, musical, kind ...(yes, I know this is fiction!) And Norah's not so bad either. 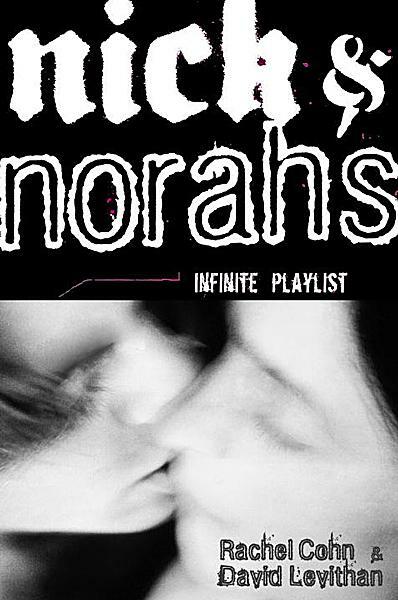 Written in alternating voice chapters, Nick and Norah's Infinite Playlist is fun, passionate and perfect for older teens. I heart Nick and Norah. This has a super cutie patootie cover on the arc that I happily snatched out of my coworker's hands! Poor Grace. She is one of 4 Graces in her class and her teacher does the unthinkable...renaming the girls with Grace "insert last initial here". When one of the Graces volunteers to be Gracie, our Grace says that she can be called just Grace. Unfortunately, her teacher begins calling her "Just Grace". Not happy news to a young girl. Just Grace's story is all over the place, not unlike most girls in the third grade. She is very concerned with "girl things" and "boy things". According to Grace, the following are boy things: "1)Spitting and making burping noises. 2) Not caring that your shirt or pants are sticky with food or mud or worse...mucus. 3)Really liking big and flashy superheroes...the kind with capes. 4) Drawing comics." [arc pp9-10] The thing is, Grace likes to draw comics. Her comic is called "Not So Super...but still good", and is a collection of her fantasies about her life. Charise Mericle Harper writes in a wonky voice that takes some time to get used to. Once I started reading in my mind in a Pinky Dinky Do voice (you parents may know what I am talking about), the flow started to actually flow for me. The book has all the trappings that 3rd grade girls will love. The aforementioned supercute cover, lists and more lists, boy-girl pre angst figuring, wonderings about her teacher/neighbour, a fascination with her flight attendant downstairs tenant, comics, and photos of kitties. I know a couple of girly girls I will be handing this to once it is published!